A boy drinks milk while sitting on his father's lap. The American Academy of Pediatrics (AAP) says it will double its recommended minimum intake of vitamin D for infants, children and teens, from 200 international units (IU) to 400 IU per day. The move comes as doctors increasingly raise concerns that children, particularly breast-fed infants, do not get enough of the vitamin, which not only promotes calcium absorption and bone health but may also stave off diseases such as cancer and multiple sclerosis. The easy fix, say doctors, is to take a daily supplement. While vitamin D is found in some common foods, kids (not to mention their parents) don't eat them in sufficient amounts. 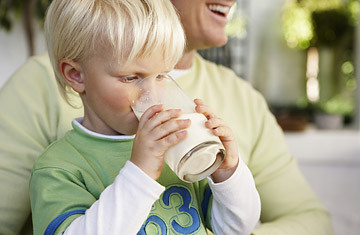 Currently, most children get their vitamin D from fortified milk or orange juice; under the AAP's new guidelines, kids would have to drink at least four glasses a day. Vitamin D is also found in cod liver oil and fatty fish such as salmon or mackerel  not terribly popular with most youngsters. And while the best way to spur vitamin D production in the body is exposure to sunlight  typically about 10 or 15 minutes at a time a few times a week  it's not always the easiest. Some climates have less sunlight than others, and people either don't spend enough time outdoors or wear sunscreen when they do, which prevents synthesis of vitamin D.
To make up the deficit, doctors suggest a daily kids' multivitamin; most varieties on the market should have at least 400 IU of vitamin D. "Supplementation is important because most children will not get enough vitamin D through diet alone," says Dr. Frank Greer, a University of Wisconsin-Madison pediatrician and co-author of the new recommendations. Infants may be the most at risk for deficiency. Earlier this year, researchers at Childrens Hospital in Boston found that 40% of 380 otherwise healthy babies and toddlers had "suboptimal" exposure to vitamin D. Even more worrisome was that breast-fed newborns were 10 times more likely to be deficient than those who were fed with baby formula, which is fortified with a large dose of vitamin D, according to the study. A large part of the problem is that mothers lack vitamin D themselves, and are therefore unable to pass enough of the nutrient to their babies. Pediatricians are quick to note, however, that breast is still best for infants. "As a pediatrician, I believe breast milk is the perfect food for infants and I applaud more and more mothers for considering it," say Dr. Catherine Gordon, a vitamin D researcher and author of the Childrens Hospital study. "Of concern, however, is the accompanying rise in cases of rickets"  a bone-softening disease usually attributable to malnutrition that can lead to fractures and bowed legs. To ensure that breast-fed babies get the vitamin D they need, she advises pregnant women to discuss with their obstetrician how to supplement their own prenatal diet with enough vitamin D; in addition, the AAP recommends supplements be given to babies as early as the first few days of life. It's unclear how much vitamin D kids really need. It depends on a host of factors: children with epilepsy, cystic fibrosis or celiac disease may need more than the 400 IUs the AAP is recommending; kids with darker skin or living at northern latitudes with less sun may also require more. That means, of course, parents should consult their own pediatrician about how much vitamin D to give, but says Gordon, "Vitamin D toxicity doesn't occur until at least 2,000 IU a day and maybe as high as 10,000, so they shouldn't be overly worried about giving kids too much." A growing body of evidence suggests that vitamin D may be a kind of wonder nutrient, playing a critical role in the prevention of diabetes, multiple sclerosis and certain cancers. Indeed, the research also suggests that adults, too, should be mindful of how much vitamin D they are or aren't getting. Many experts recommend that 1,000 IU a day for adults isn't too much. Still, similar assertions were made about Vitamin E in the 1990s before elevated doses were associated with a higher incidence of lung cancer. Nonetheless, at 400 IU, Gordon says, "The AAP's new guidance can only lead to healthier kids."